The Invoice settings screen may be accessed via MIDAS Admin Options → Manage MIDAS → Invoicing, and allows you to change various invoicing settings within MIDAS. The "tax" element (percentage) to be added to invoices by default. Setting this to "0" will not apply any tax by default to created invoices. The number of days you allow your clients to pay their invoices from the date of invoice. This value can be used in conjunction with Scheduled Tasks to automatically send clients payment reminders / payment overdue notifications. This setting allows you to include the contents of an additional booking field in the notes section of your generated invoices. For example, setting this to "Notes" will combine the booking notes of all bookings included on subsequently generated invoices. Ticking the additional "Itemize?" box would itemize these notes, associating each to its corresponding booking on the invoice. 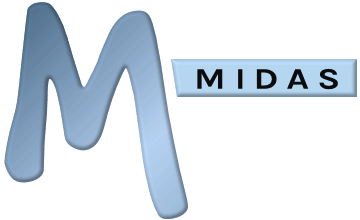 When bookings are added to MIDAS a small "Create Invoice?" tick box is shown. If "Create Invoices by default" is selected, this tick box will always be ticked by default i.e. an invoice will be created for every booking, unless otherwise specified. If selected, when invoices are generated, MIDAS will automatically round up totals to their nearest whole unit. Indicate charges on Booking Availability screen? If selected, total venue/resource charges will be indicated on the Booking Availability screen for users with Invoicing permissions. Include zero value invoice items? If selected, venues and resources for which there is no charge will still be included on invoices for completeness and/or if you need to denote that the client is getting something free of charge. If this option is not selected, items whose total charge is zero will not appear on generated invoices. Create invoices if invoice total is zero? If unselected, MIDAS will only generate invoices where the invoice total is greater than zero. If selected, MIDAS will generate invoices regardless of invoice total. Automatically mark invoices totaling zero as paid? If selected, then any invoice MIDAS generates that has a total of zero will automatically be marked as "Paid in Full". Prevent modification/deletion of bookings for which invoices have been created? This setting will "protect" bookings, for which invoices have been created, from further modification or deletion. Such bookings can then only be modified/delete once their associated invoices have been deleted or until this setting is disabled. This setting applies to all users, meaning that when enabled, no user will be able to modify/delete such bookings. Set to "Never", invoices can be deleted from the system at any time. Set to "After sending, until paid in full" will prevent invoices that have been sent (i.e. printed or emailed) from being deleted, until such time as the invoice has been paid in full. Invoices that have been created but not sent, or those paid in full, can still be deleted with this option selected. No invoices can be deleted from the system at all whilst the "Always" option is set. This setting controls which elements of a booking a booking type discount should be applied to. You can choose to have booking type discounts applied to venue rates only, resource charges only, or both. If you've set up discount rates depending upon the type of booking, when MIDAS generates invoices, it will apply this discount, and reference the fact that a particular discount has been applied. Enabling the "Apply Discounts Silently" option will still apply these discounts, but no reference to the fact that a discount has been applied will appear on your invoices. If enabled, the Deposit Invoice settings instruct MIDAS to automatically generate separate deposit invoices (in addition to "regular") invoices. This feature is useful if you normally charge your clients a "damage" or "security" deposit in advance of their bookings, or if you require "part payment" prior to their bookings taking place. Here you can set how much should be charged on deposit invoices - be it either be a fixed amount, or invoiced as a percentage of the total cost of the venue & resource usage of the original booking(s). The "Deposit Invoice Prefix" setting, allows specifying a short "prefix" to add to the start of your incremental deposit invoice numbers. This prefix must be different to the Regular and Cancellation invoice prefix settings. The Cancellation Invoice settings instruct MIDAS to automatically generate invoices if a client's booking is canceled (deleted) at short notice. You can set how close to the commencement of a booking (in hours or days) a cancellation invoice should be generated if a booking is then canceled in that period. For example, a setting of "1 day" will mean that a cancellation invoice will be automatically created for any booking that is canceled less than 24 hours before it was due to commence. You can then define what the late cancellation fee should be - it can either be a fixed amount, or charged as a percentage of the total cost of the venue & resource usage of the original booking that has been canceled. The "Cancellation Invoice Prefix" setting, allows specifying a short "prefix" to add to the start of your incremental cancellation invoice numbers. This prefix must be different to the Regular and Deposit invoice prefix settings. MIDAS provides ability to allow your clients to pay online, invoices generated by your MIDAS system. If you have a PayPal and/or Stripe account, specify your account details in the "Online Payments" section to allow your clients to pay their invoices online using a major credit/debit card or PayPal account. Setting this option will require clients to enter their Invoice Number, Invoice Date and their email address in order to view and pay their Invoice online. Unselected, clients will only need to enter their Invoice Number and Invoice Date. If you email invoices to all your clients through MIDAS, you should consider selecting this option for increased security. Clients without an email address on record within MIDAS will not be able to pay their invoices online if this option is selected. If you print off and post physical invoices to clients, and their email addresses are not present in MIDAS, you should consider de-selecting this option to allow your clients to pay their invoices online. If this setting is selected, then your clients can choose to make partial payments online against their invoices. If this setting is not enabled, then when clients go to pay their invoices online, they will only be able to pay them in full.